If existing drawers are in poor condition, replace them with dovetailed drawer boxes. Take this opportunity to upgrade to soft-close, full-extension slides to increase the usable spaces in each drawer. 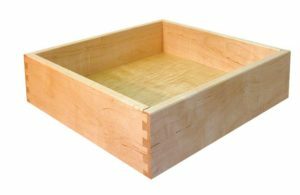 Keystone’s soft maple drawer boxes feature one-piece sides up to 8” high and a chamfered top edge. See the Drawer Boxes section of this website for more box details and drawer slide options. Laser engraving available. Cutlery trays and inserts for wine, spices, and more can be made to fit new or existing drawers. In place of a standard drawer, add a peg board drawer or double cutlery drawer for increased functionality. Boxes and inserts can be customized to suit the needs of your customer. For instance, add a knife block insert to the bottom level of a double cutlery tray. See the Drawer Boxes section of this website for more cutlery tray options, divider drawers, trash bin pull-outs, and more. Add a custom-size cabinet where an appliance or soffit was removed, or if you have one or two cabinets that are in poor condition and not suitable to reface. 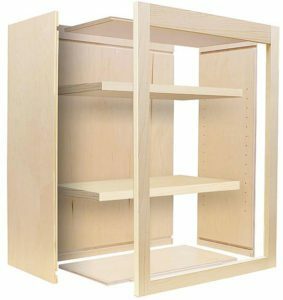 Keystone offers ready-to-assemble (RTA) cabinets in any size, wood species, and finish to fit your application. See the RTA Cabinets page for more information. Changing the look of a kitchen can be simple and affordable.